The mechanism of CRH action is pictured in Figure 3-13. It operates through a cell membrane receptor and then through a transducing G protein to cause the stimulation of the catalytic subunit of adenylate cyclase (detailed in Chapter 1). Through the stimulation of protein kinase A by the increased level of cyclic AMP (also described in Chapter 1), ACTH is released from the corticotroph of the anterior pituitary. Vasopressin also increases the secretion of ACTH, as does angiotensin II. The main role of vasopressin appears to be one of helping CRH in this activity. Glucocorticoids exert negative feedback (see Chapter 1) on the level of proopiomelanocortin message, leading to a decrease in the secretion of ACTH. A three-dimensional structure of human CRH has been modeled from NMR data, as shown in Figure 3-14. 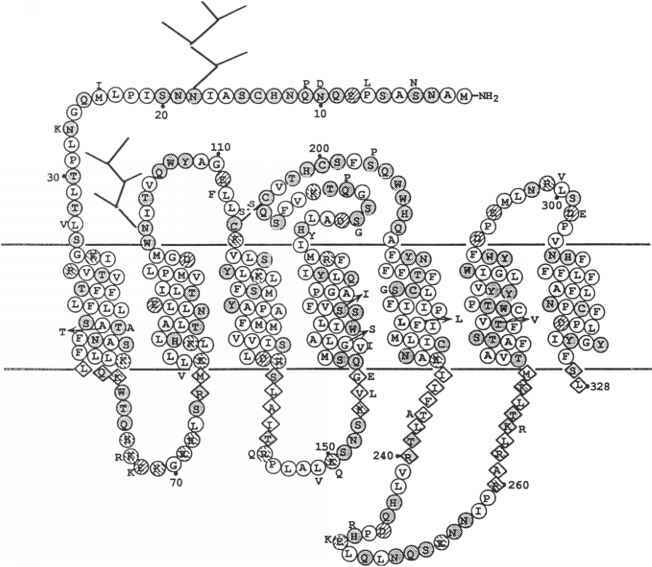 The molecular mechanism of action of GnRH on the gonadotroph is diagrammed in Figure 3-15. This releasing hormone operates by activating the phosphatidylinositol pathway, which leads to the activation of protein kinase C and calmodulin through increased calcium ion levels in the cytoplasm. These activities lead to the secretion of gonadotropins into general circulation, as well as to an increased level of the fi-subunit of the luteinizing hormone by gene activation. Interestingly, the gene encoding GnRH also encodes information for a GnRH-associated protein (GAP). The GAP may be acting as an aid in the correct conformation of GnRH, perhaps analogous in some way to the neurophysins produced by the same gene for either oxytocin or vasopressin. FIGURE 3-12 Schematic diagram of the human GnRHR. Glycosylation sites, possible «-helical extensions of the transmembrane domains, and amino acid class are indicated. The adjacent letters represent the corresponding amino acids, which vary in the mouse GnRHR. Km is not present in the mouse receptor. Reproduced with permission from Chi L., Zhou, W., Prikhozhan, A., Flanagan, C., Davidson, J. S., Golembo, M., Illing, N„ Millar, R. P., and Sealfon, S. C„ (1993). Cloning and characterization of the human GnRH receptor. Mol. Cell. Endocrinol. 91, R1-R6. operate through regulation of the catalytic subunit of adenylate cyclase, where GHRH is on the stimulatory pathway and somatostatin is on the inhibitory pathway. These actions culminate in the control of the cytoplasmic level of calcium ions through specific phosphorylation reactions of protein kinase A, and the enhanced level of calcium ions is the direct signal for the secretion of growth hormone. It is not clear whether there may be some stimulation of the phosphatidylino-sitol cycle and whether this activity could also contrib ute to the elevated level of calcium ions in the cytoplasm. Moreover, it seems possible (Figure 3-17) that there is direct communication between somatostatin neurons and GHRH-containing arcuate neurons within the hypothalamus. 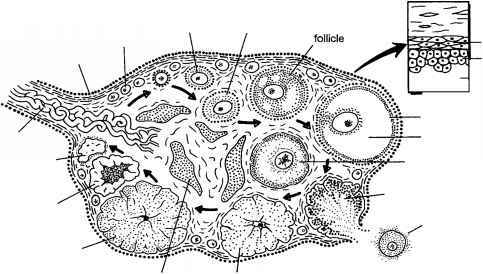 Thus, the secretions of both hormones could be delivered together to the somato-mammotroph to regulate the secretion of GH. The other releasing factors would operate in a fashion similar to the two types shown here, as summarized in Table 3-4.